This is just about the most colorful beanie on the face of the planet. The rainbow hues work very well with the variegated layers of the hat made using different stitches. The pom-pom at the top is just the icing on this very sweet cake. Of course, if rainbows are not your (or your child’s) thing, you can vary the hues to match any taste and outfit. This hat wouldn’t come amiss either as a present or donation to charity. I daresay that if you could manufacture these, you might even be able to sell them. For more free designs every day follow us on Facebook. Share your ideas and your work on our Facebook group! 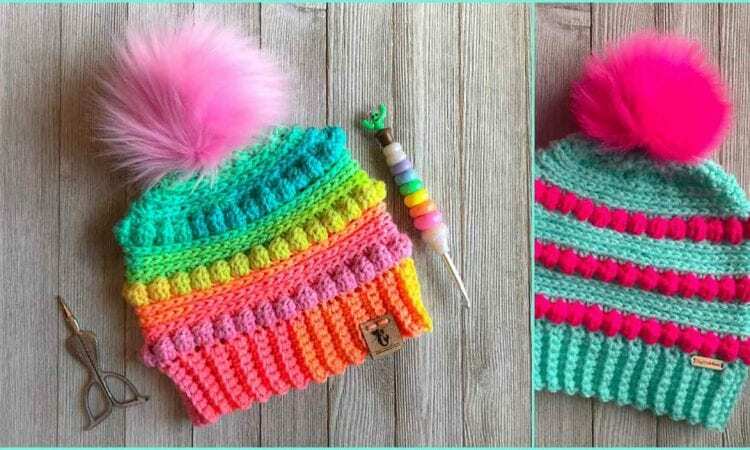 Bubblegum Pop Beanie – visit the free pattern site.